d-Amino acids are the enantiomers of l-amino acids used as building blocks of proteins and were previously unknown as to pathophysiological roles. However, increasing numbers of recent studies have suggested importance of d-amino acids. d-Serine (d-Ser) works as a co-agonist of the NMDA receptor, an ion channel for neurotransmission. A decrease in the amount of d-Ser in brain has been observed in patients of schizophrenia. It has been suggested that d-aspartate (d-Asp) is related with the regulation of motor neurons, memory, and mental disorders. Cognate flavoenzymes such as d-amino acid oxidase (DAO) and d-aspartate oxidase (DDO) regulate the amount of d-Ser and d-Asp in our body, respectively, to modulate such biological events. 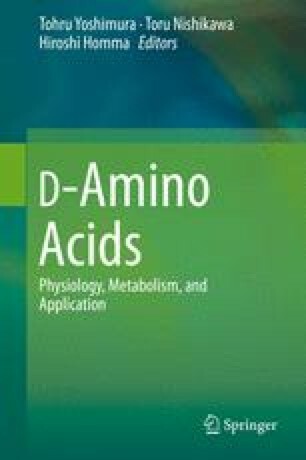 We therefore have proposed that the “d-amino acid biosystems” play important roles in our bodies. Chemicals that modulate the enzymatic activity of DAO and DDO are expected as potent therapeutic drugs for schizophrenia and other mental disorders.